Public prosecutors in the province of Cáceres have opened a criminal investigation into animal cruelty after disturbing video footage circulated on social media this week showed at least a dozen hunting dogs hurdling over a cliff along with a deer they were attacking at the urging of a hunter in the Riberos de Tajo region of Extremadura. The footage prompted animal-rights party PACMA and other groups to call for an immediate investigation as the scene of animals in free-fall down the side of a cliff inflamed public opinion and received widespread coverage from Spanish and international news media. 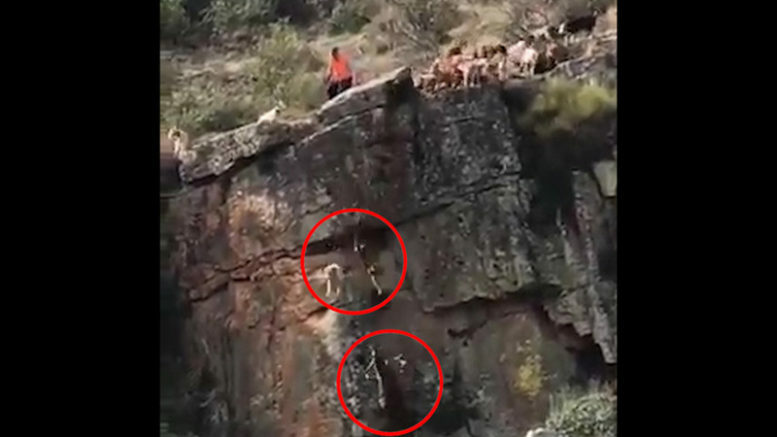 The video shows the deer being attacked by a pack of the dogs, while a hunter approaches and unsheathes a long hunting knife that he uses to stab the deer as his dogs are falling over the cliff and into the gorge below. At least 12 dogs are believed to have fallen several meters along with the deer down the cliff face. The Federación Extremeña de Caza (Extremadura Hunting Federation) confirmed that one of the dogs was crushed to death by the falling deer and another dog broke a leg in the fall. On Tuesday, the public prosecutors office in Cáceres noted in a statement that “dogs are pets whose health and integrity is protected by the Penal Code against unjustified abuse resulting in death or injuries” and instructed the Seprona nature protection unit of the Guardia Civil to open an investigation into animal cruelty. The Real Federación Española de Caza (Royal Spanish Hunting Federation, RFEC) claimed the footage represented an isolated incident and was part of a campaign by the animal-rights “lobby” and leftwing politicians to demonize hunting for ideological ends. The RFEC said the injured dogs were treated by veterinarians at the scene, though failed to provide any specific evidence to that effect.